Choose Preservation Exteriors for quality roofing repairs when you have leaks from general aging or storm damage such as hail or wind. We work with all insurance companies to ensure full coverage. Transform the exterior look of your home with quality siding, that will protect your home for years to come. Choose Vinyl, Stone, Composite, Metal or wood. Preservation Exteriors offers Roofing, Siding, Gutters, Insulation, Masonry & Stone Work services to residential and commercial clients throughout Summit, Portage, Medina, and Stark Counties in Ohio. Our company has been in the same location with the same management delivering the same long-lasting solutions since 1996. Our highly experienced staff completes all projects with the highest quality workmanship. Crew leaders and installers are all Certainteed Certified Shingle Masters. We feature a 10 Year Workmanship Warranty. We also offer a Manufacture backed Lifetime Warranty. 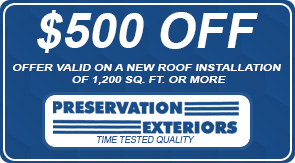 Contact us today to schedule a free Evaluation and Estimate.